This book is for software professionals who develop and implement reporting solutions using Microsoft SQL Server. It is especially relevant for professionals who are software engineers, software architects, DW/BI engineers, and DW/BI architects who perform simple to complex report authoring implementations. This book is also suitable for those who develop software solutions that integrate reporting solutions and are keen to learn about Microsoft SQL Server 2016&apos;s features and capabilities. This book contains recipes that explore the new and advanced features added to SQL Server 2016. The first few chapters cover recipes on configuring components and how to explore these new features. You&apos;ll learn to build your own reporting solution with data tools and report builder, along with learning techniques to create visually appealing reports. This book also has recipes for enhanced mobile reporting solutions, accessing these solutions effectively, and delivering interactive business intelligence solutions. Towards the end of the book, you&apos;ll get to grips with running reporting services in SharePoint integrated mode and be able to administer, monitor, and secure your reporting solution. 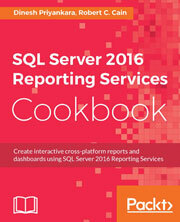 This comprehensive cookbook follows a problem-solution approach to help you overcome any obstacle when creating interactive, visually-appealing reports using SQL Server 2016 Reporting Services. Each recipe focuses on a specific task and is written in a clear, solution-focused style.